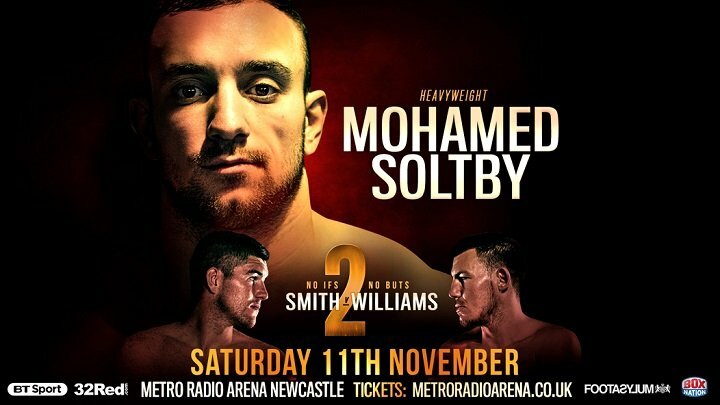 Undefeated Heavyweight talent Mohamed Soltby has been added to the highly-anticipated Liam Smith v Liam Williams 2 Newcastle Metro Radio Arena card on Saturday 11th November. Soltby (13-0, 8 KOs) will fight over eight rounds in his second contest in the UK after he demolished Hungarian Ferenc Zsalek in one round at the Bowlers Exhibition Centre in Manchester earlier this year. Trained by the legendary former WBO Lightweight World Champion Artur Grigorian, Soltby is hoping to fire himself into Heavyweight title contention with another explosive performance in Newcastle. “I see a lot of fighters in the UK who are making waves in the heavyweight division,” said Soltby. “I know I have what it takes to beat them. I would love to fight the winner of Gorman v Webb, and have one eye on Agit Yabayel, who fights has-been Chisora for the European title. Main event at the Metro Radio Arena sees former WBO Super-Welterweight World Champion Liam Smith rematch with reigning British Champion Liam Williams a WBO World Title Eliminator.